The loop described here is probably the most popular hike in the park, and for good reason. The narrow confines of the Inner Canyon are littered with mammoth boulders begging to be scaled, and the 150-foot canyon walls, composed of volcanic rhyolite and sedimentary Castle Rock conglomerate, are favorites among local rock climbers. 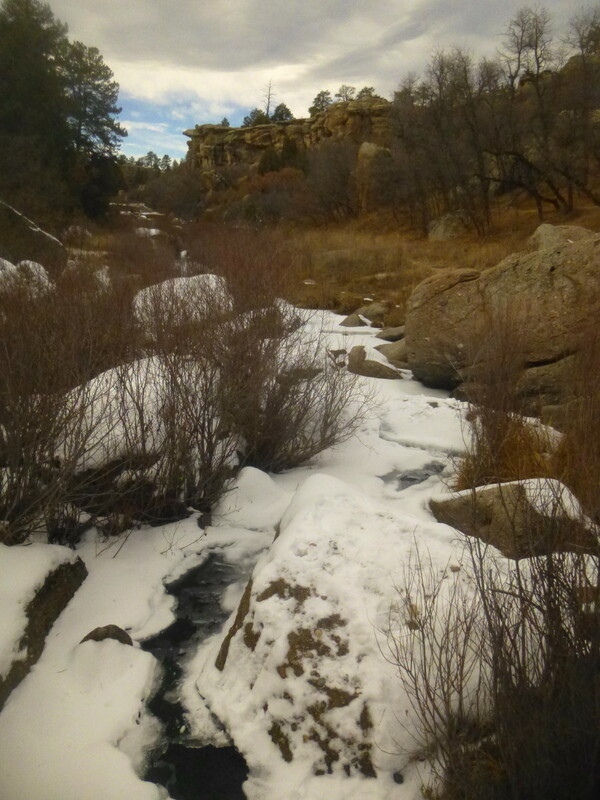 Though winters often bring smatterings of snow to Castlewood, the beauty of this low-elevation park (roughly 6,300’) is that it offers hiking opportunities year-round. 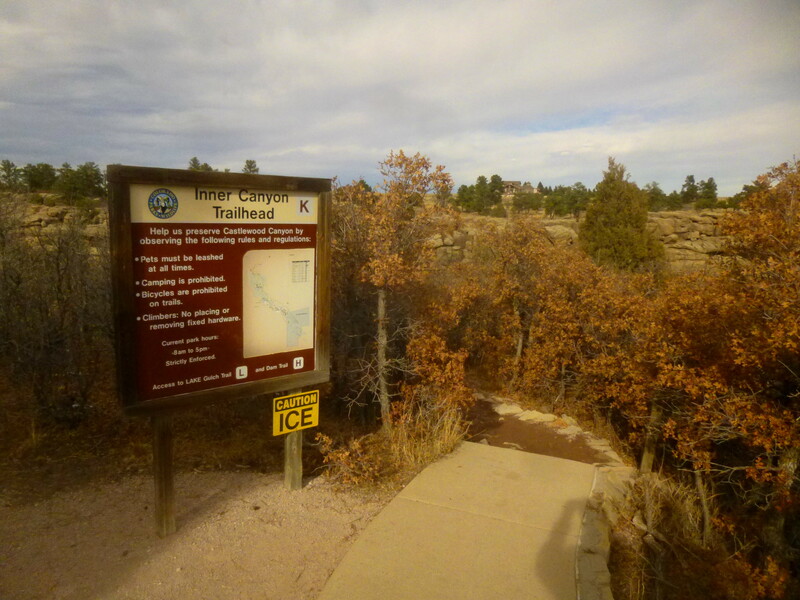 The 1.8-mile loop begins and ends at the Canyon Point parking lot, found at the end of the park drive in Castlewood’s eastern corridor (the western section can be accessed via Castlewood Canyon Rd., ½ mile west of Franktown on Route 86; see map). On a clear day, it’s hard to miss the snowy peaks of the Front Range in the distance – the escarpment on which the park sits offers spectacular views of Pikes Peak (14,114’) to the southwest. On the November afternoon my family visited the park, the thought of descending into a canyon at the expense of such vistas prompted a few short moments of hesitation. 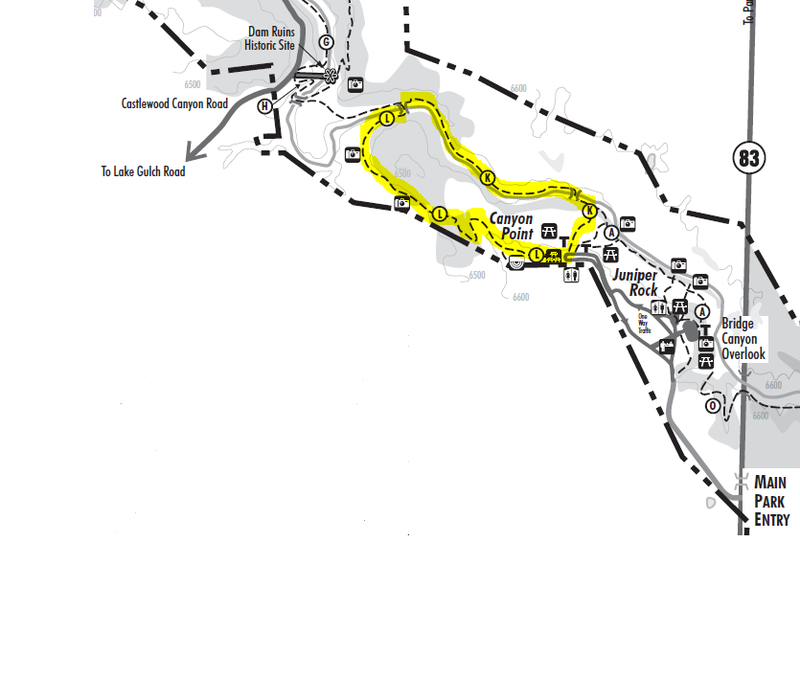 There are four paths, all paved at first, leaving from the Canyon Point parking lot; the two westernmost are the Lake Gulch and Inner Canyon trails. 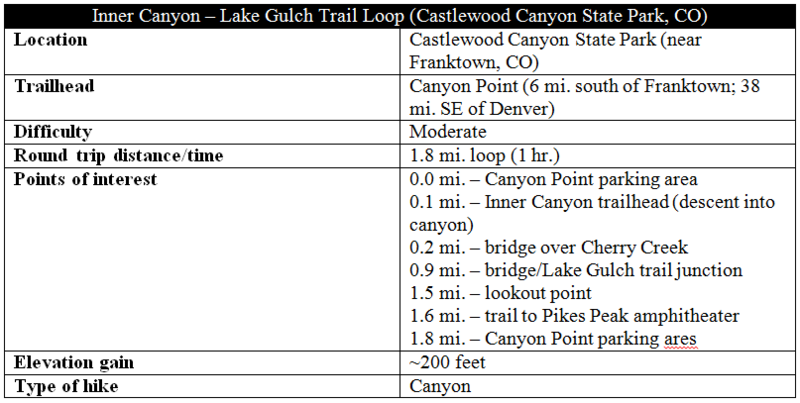 To avoid a precipitous (and possibly snow-covered) climb at the end of the hike, I suggest descending into Inner Canyon first, returning counterclockwise via the more gradual Lake Gulch route (though hikers with weary knees should perhaps do the opposite). The paved path to the brink of the Inner Canyon weaves 100-200 yards through grasslands and montane shrublands before ending abruptly at the (well-marked) Inner Canyon Trailhead, where the pavement stops and the packed dirt trail begins. The footpath cuts sharply to the left and immediately begins the knee-buckling descent into the canyon. 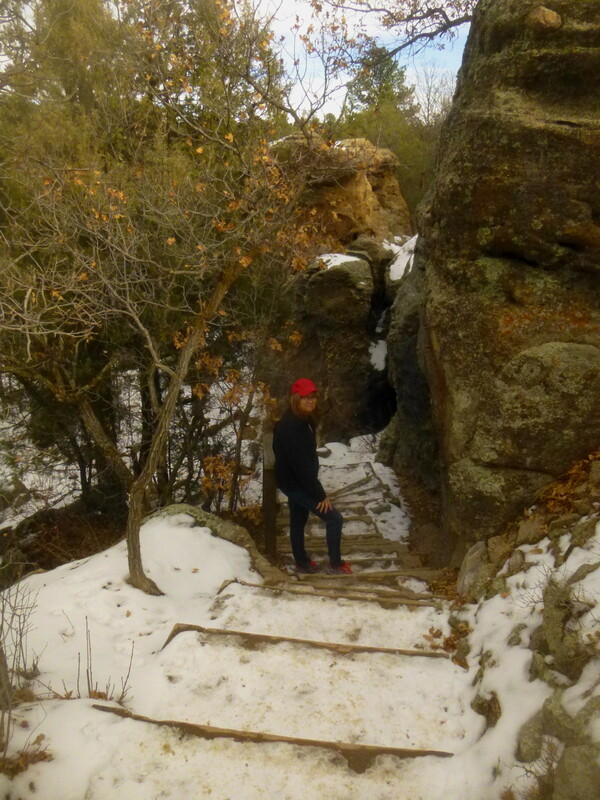 Several dozen wooden steps – as well as slippery white powder on our November hike – stand between you and the canyon bottom as the route switchbacks down the ponderosa pine-lined slope. 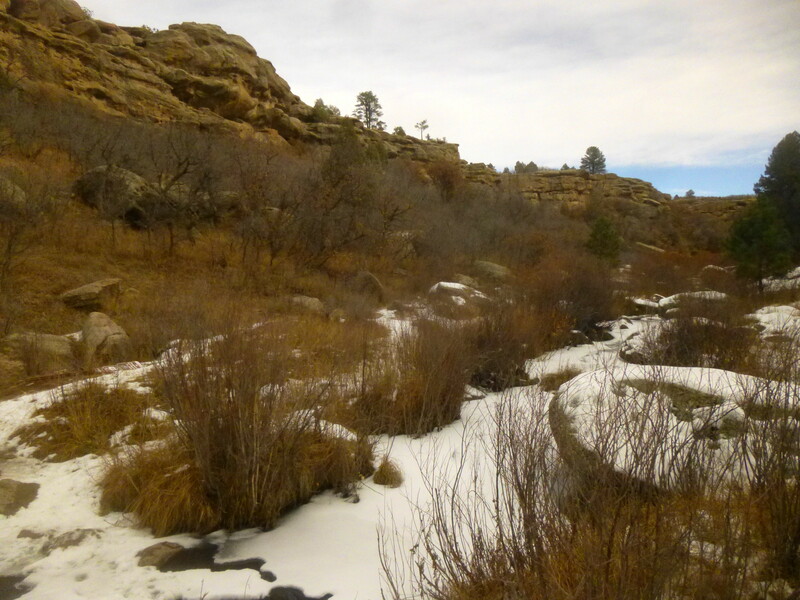 Before you know it, however, you’re down amid the canyon shrublands crossing a primitive wooden bridge over Cherry Creek, the same stream that passes through downtown Denver 40 miles to the north. 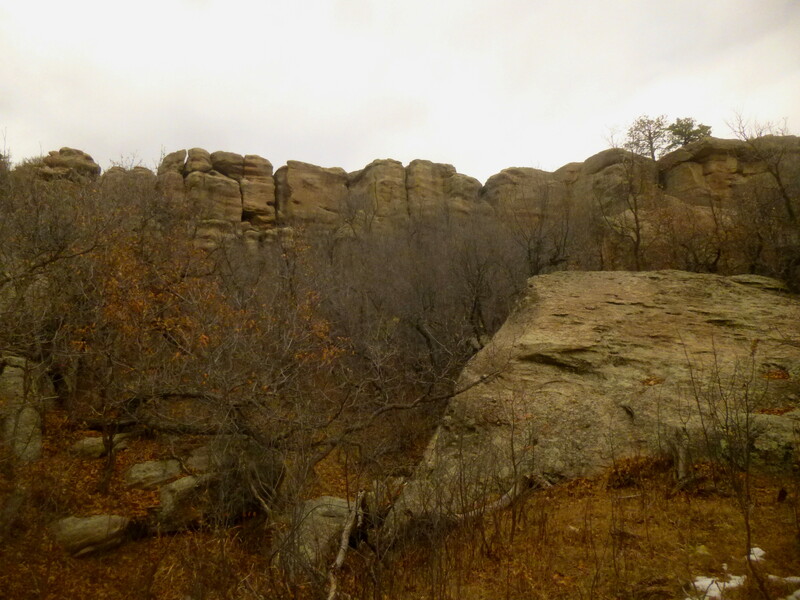 There are three geological features of note in this section of Castlewood Canyon. 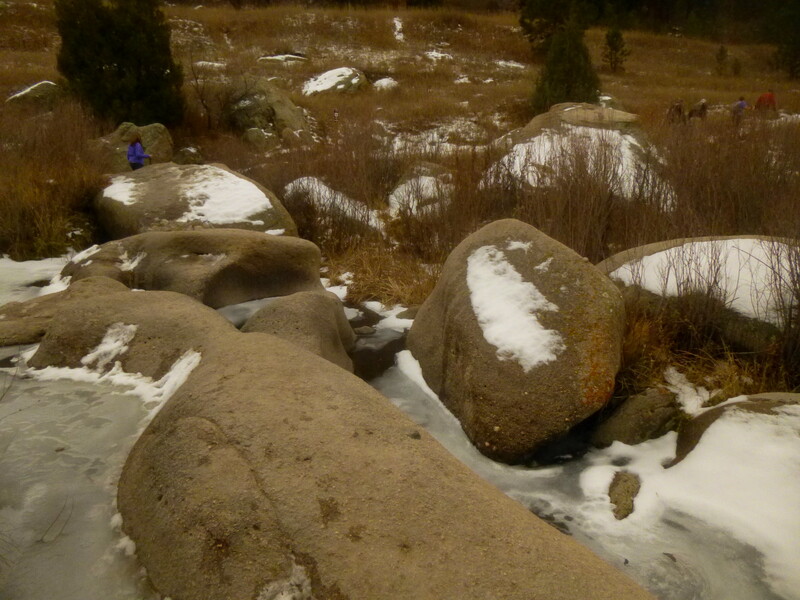 First, it is hard to miss the hundreds of smooth grey boulders crowding Cherry Creek: these colossal mounds of rock actually began as grains of sand, washed downstream from the Rockies millions of years ago before hardening into the “caprock” that formed the upper layers of the earth’s crust in this area. Millions more years of erosion sent the rocks tumbling down from the canyon walls and into the rushing waters below. A second notable feature is the presence of an igneous rock called rhyolite (also known as ignimbrite). The rhyolite rocks in this region are thought to have been catapulted 90 miles through the air during a volcanic eruption near present-day Salida, Colorado some 36 million years ago. Gradually buried under other geological layers, they were unearthed once more as Cherry Creek carved out the canyon present today. 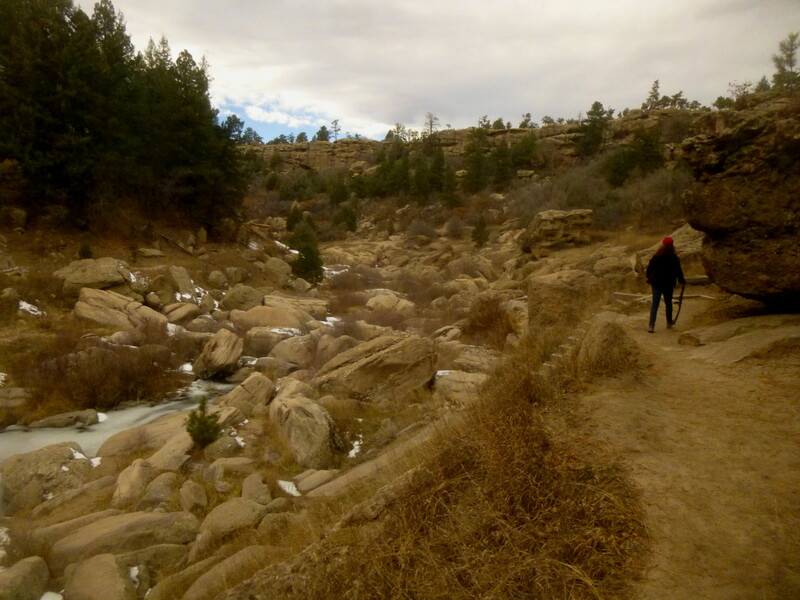 As the trail follows the right bank of Cherry Creek, you will also notice the striking contrast between the canyon’s two sides. The left flank is shady and shrouded by pines; the right bank is more exposed, and there are very few evergreens. 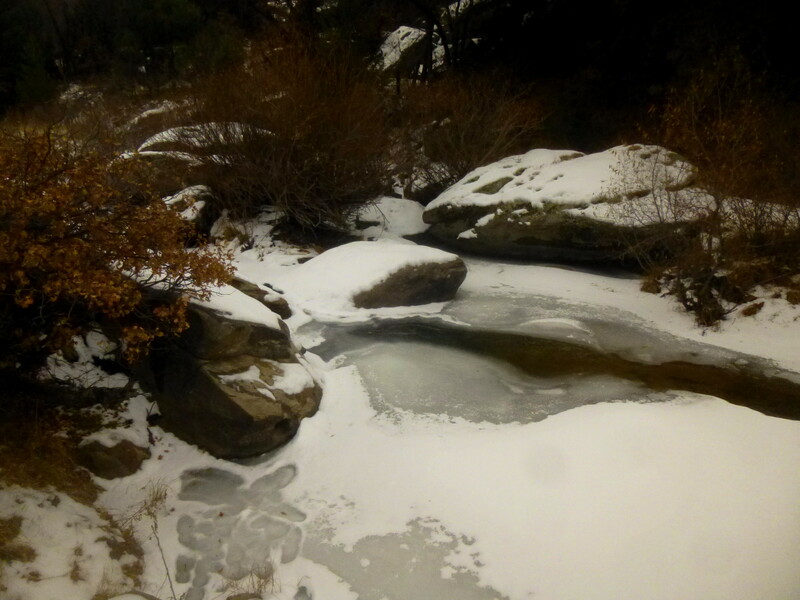 On the day we visited, the crisp, slushy snow –ubiquitous on the left bank – was nowhere to be found on the opposite side of the creek. 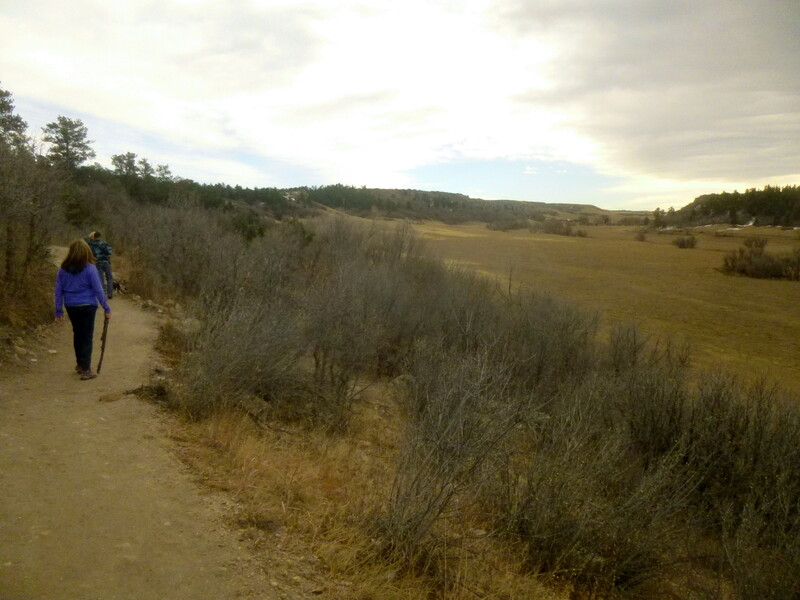 The 7/10 mile jaunt between the first bridge over Cherry Creek and the second (at the Lake Gulch trail junction) is mostly flat and extremely enjoyable. It is not uncommon to spot climbers scaling the mushroom-shaped canyon walls or kids rock-hopping across the stream off to the left. About 1/2 mile past the bridge, the canyon begins to open up, revealing a particularly boulder-strewn canyon bottom as the creek curves off to the left. At this point, the trail sharply drops elevation, descending a series of wooden steps for a closer view of the creek. This is perhaps the most interesting part of the hike. 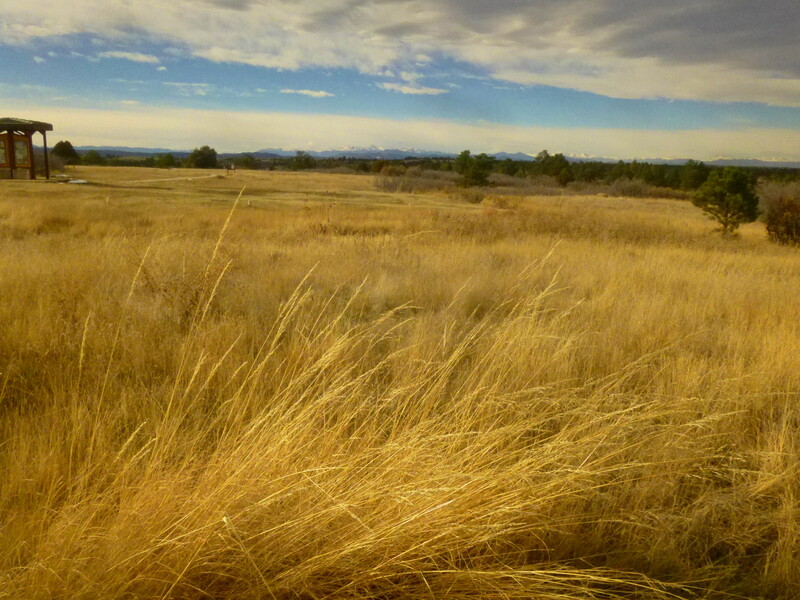 The biggest surprise comes near the junction with the Lake Gulch trail, where the canyon suddenly sputters out into a broad meadow. This marks the interregnum of sorts between the park’s two sections – east and west. 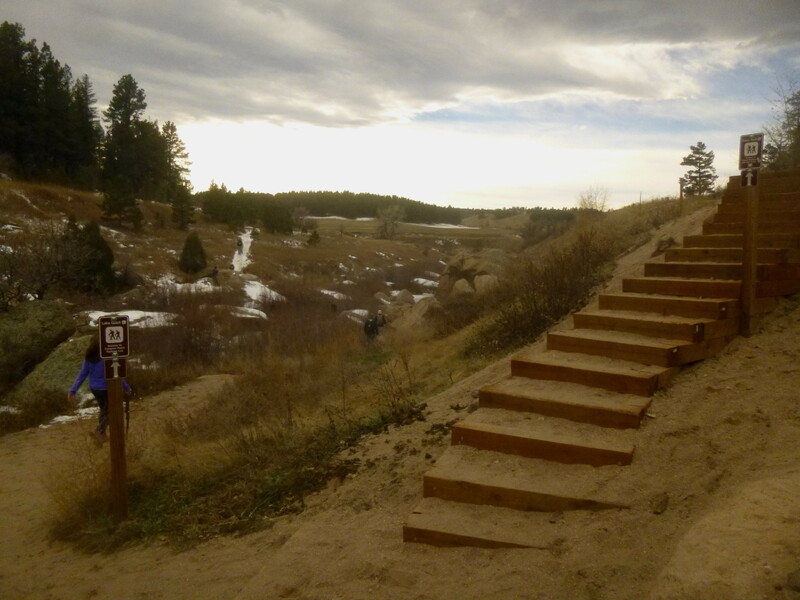 Continuing straight up another set of stairs (marked “Dam Trail”) will lead hikers through the open expanse, past the remains of the infamous Castlewood Canyon Dam, and onwards toward Castlewood Canyon Road and the western entry to the park. Beyond the creek, the route is relatively straightforward: the trail skirts the edge of a bluff, climbing gradually back toward Canyon Point. 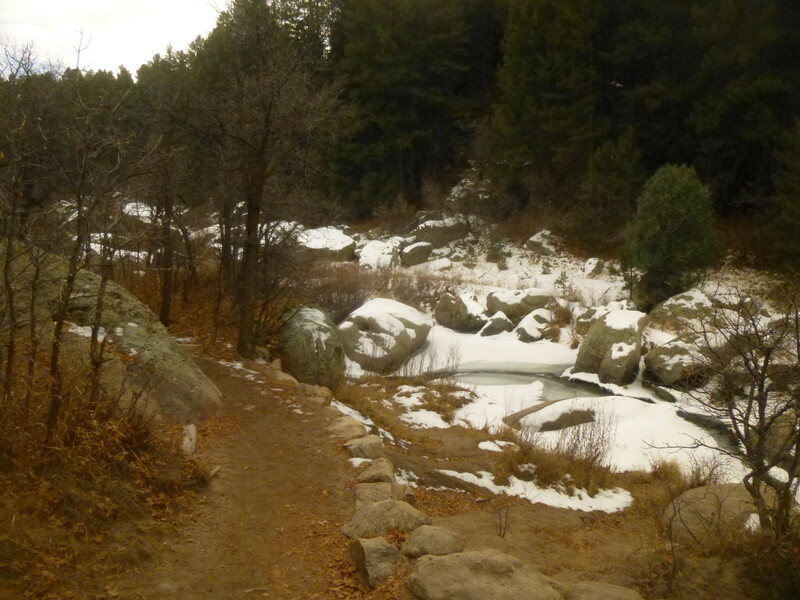 Views of Lake Gulch, an offshoot of Castlewood, can be a bit underwhelming following a scenic half-hour in the canyon itself, but the pine-lined meadow is charming in its own way. One can imagine being quite happy owning a homestead out here – especially as Pikes Peak again pops into view as the Lake Gulch trail climbs over the top of the bluff. There is a nice overlook, complete with a picnic table, about 0.6 miles beyond the creek crossing. 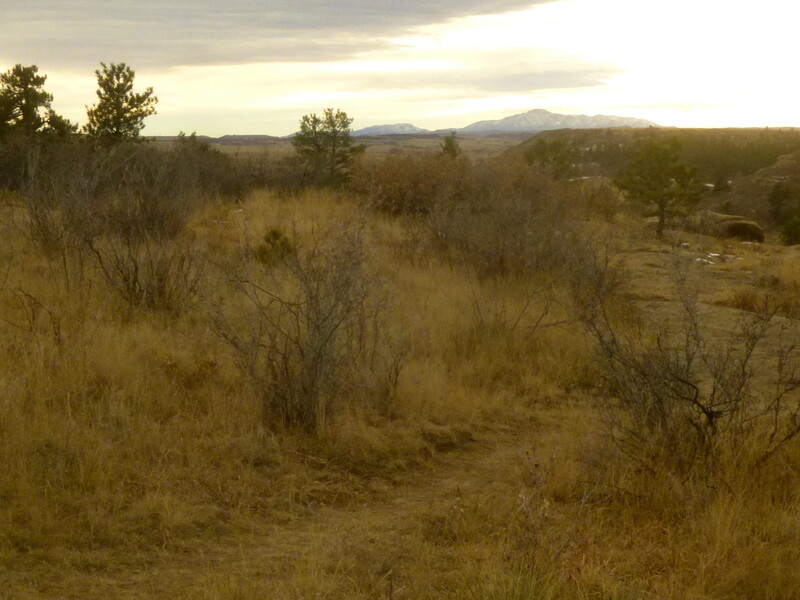 150-200 yards farther, the emergence of a concrete trail indicates that the end is near. Pikes Peak amphitheater, used for educational and social events, can be accessed via a short spur trail to the right. From here it is an easy 1/5 mile back to the parking lot, the terminus of this quick yet rewarding stroll through Castlewood Canyon. 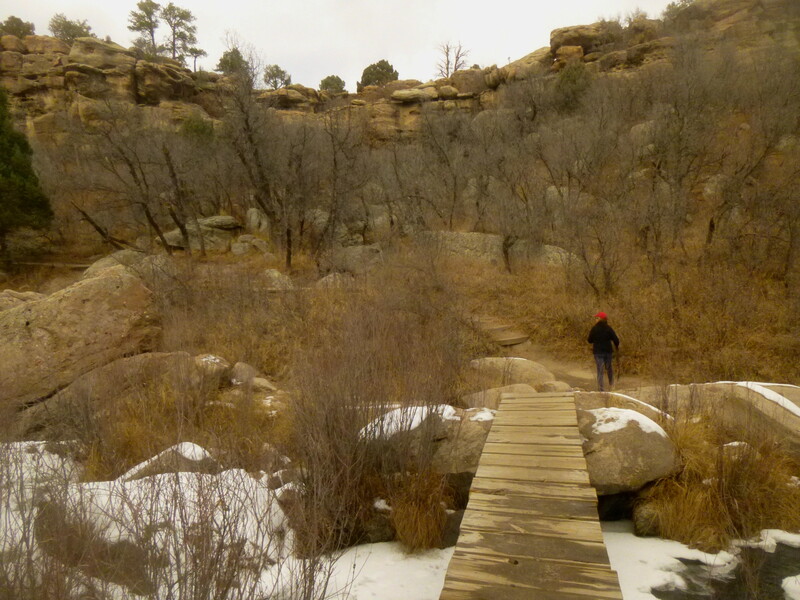 Through the end of 2015, Castlewood Canyon State Park is offering challenge coins to any hiker who logs 100 total miles on the park’s 15 trails. Keep track of your miles here and return a completed sheet to the Visitor Center (in the eastern section) to receive your prize. 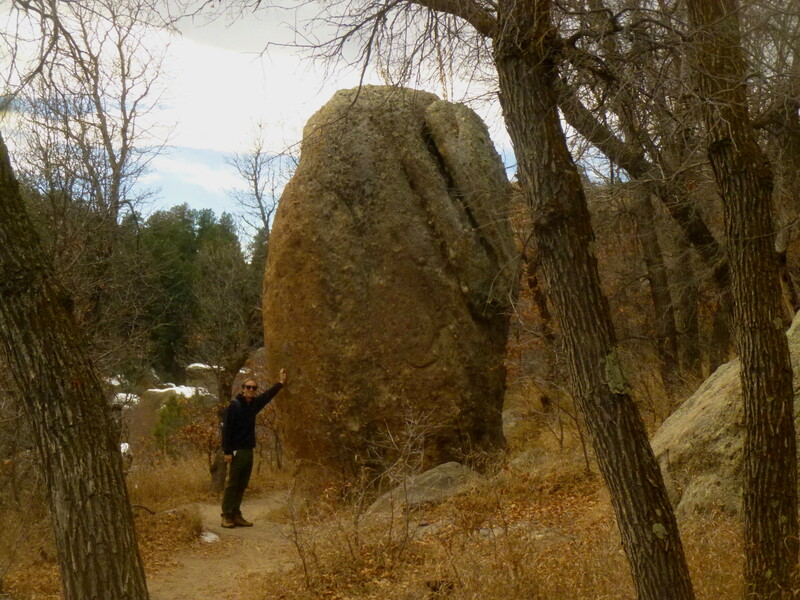 This entry was posted in Colorado, Colorado State Parks, Moderate Hikes and tagged canyon, Canyon Point, Castle Rock conglomerate, Castlewood Canyon, Castlewood Canyon State Park, Cherry Creek, Colorado, Denver, Inner Canyon Trail, Lake Gulch Trail, loop hike, Pikes Peak, rhyolite. Bookmark the permalink.